You can climb the seven hills, visit the ancient neighborhoods, stroll on Rossio and Chiado, marvel at the monuments in Belem, but you’ll not fully appreciate Lisbon until you’ve seen it from the Tagus river. The easiest way to travel on the river is to board one of the Cacilheiros that shuttle passengers between the river margins. But nothing compares to the thrill of crossing the Tagus waters on a sailboat. Traveling in luxurious silence, guided by the trade winds, the currents wash away our cares and we feel like we had a month of vacation rolled into a few hours. We follow the path of so many sailors who left Lisbon not knowing if they’d make it back. When these explorers survived the perilous seas and reached the blue calm of the Tagus river, they saw Lisbon as an echo of paradise, glowing in warm light, dressed in bright white and festive orange, welcoming their return. To see the schedule of the cacilheiros click here. 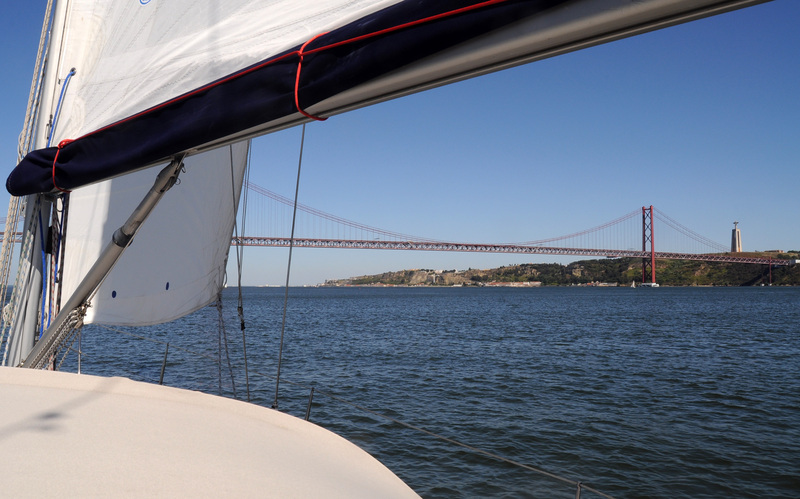 The best way to sail on the Tagus is to have a generous friend who has a sailboat and invites you to come along. If this method does not work for you, a second possibility is to email António Matos at topematos@hotmail.com. He is a sailing pro who can set you up with a boat and a crew. And he’s very nice, so you might become friends. This sounds absolutely wonderful…but unfortunately I don’t have deep pockets….sigh…. Just the kind of trip I would enjoy. If you take the last ferry from Calcilhas to Caís do Sodre you can also enjoy a kind of silence – in a cheaper way 🙂 the most sailing trips in Lisbon are for “party people” 😦 Is Antonio offering private sailing trips? Sailing on the Tagus is really a fantastic experience. Antonio arranges private sailing trips for groups.